Chicago is the third largest city in the United States after New York and Los Angeles. It is home to an estimated 2.7 million residents. Chicago has many nicknames. One of those nicknames is the "Windy City." This moniker wasn't inspired by weather trends, but by hot air bellowing from politicians instead. Chicago is an important center of commerce and trade and has the fourth-largest gross domestic product (GDP) of any metropolitan area in the world. Chicago has two international airports. The larger of the two, Chicago O'Hare International Airport, is one of the world's busiest. The world's first modern skyscraper was built in Chicago in 1885. Known as the Home Insurance Building, it was demolished in 1931 to make way for the art deco-style Field Building. Chicago. Chi-Town. The Second City. The Windy City. The City of Broad Shoulders. Whatever you choose to call it, there is no doubting that this largest metropolis in the Midwest has plenty to offer the curious visitor. Amazing city parks like Grant Park and Lincoln Park, inviting restaurants that showcase virtually every kind of cuisine, the tempting shops along the famous Miracle Mile, and a rich history are just some of the reasons to visit Chicago. This is also a dream destination for cultural enthusiasts, anyone who appreciates architecture, and those who enjoy taking in professional sporting events. The numerous Chicago attractions undoubtedly combine to present entertainment options for every age and interest, and thanks in part to the city's competent public transportation system, getting around to all the main points of interest is a breeze. Chicago is renowned for its architecture. This is where the skyscraper was born, and such famous architects as Frank Lloyd Wright, Louis Sullivan, and Ludwig Mies van der Rohe figure among those who have left their marks on the city. At the heart of things is the dynamic Chicago skyline. A harmonious mix of historic and modern buildings, this is one of the tallest skylines in the world. Soaring highest in the vast sea of buildings that populate downtown Chicago's "Loop" area are the Willis Tower (formerly the Sears Tower) and the newer Trump International Hotel and Tower. Heading outside of the Loop, Frank Lloyd Wright's Frederick C. Robie House is among the architectural stand outs. This famous home dates back to 1909 and is more specifically found at 5757 S. Woodlawn Avenue in the Hyde Park neighborhood. 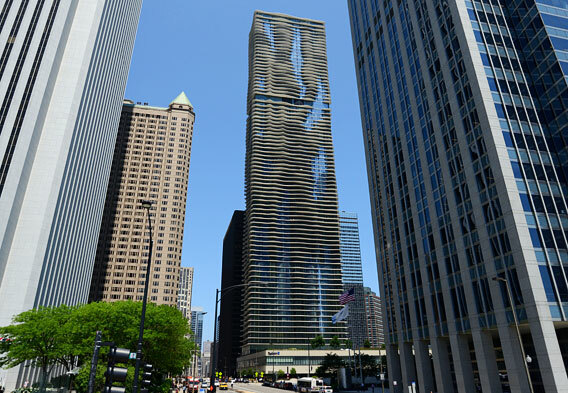 Thanks to Chicago's architectural merits, the city is tailor made for architecture tours. In fact, taking architecture tours is one of the most popular things to do among Chicago visitors. The Chicago Architecture Foundation alone offers more than 85 Chicago architecture tours. Among these are boat tours (pictured). The comfortable boats that are employed on these tours cruise along the Chicago River before taking passengers out on Lake Michigan for breathtaking views of the Chicago skyline. Along the way, certified guides interpret more than 50 buildings, offering wonderful insight into Chicago architecture on the whole. Chicago has a strong club scene and is an all around great destination for those who like to indulge in nightlife. In relation to the club scene in particular, Chicago was where house music was born in the 1980s. Speaking to this history and carrying on the legacy are several industrial-style dance clubs. These kinds of Chicago nightclubs specialize in just one main type of music or offer a more broad musical mix while highlighting the latest DJ-driven trends. Some of the Chicago nightclubs are quite large. 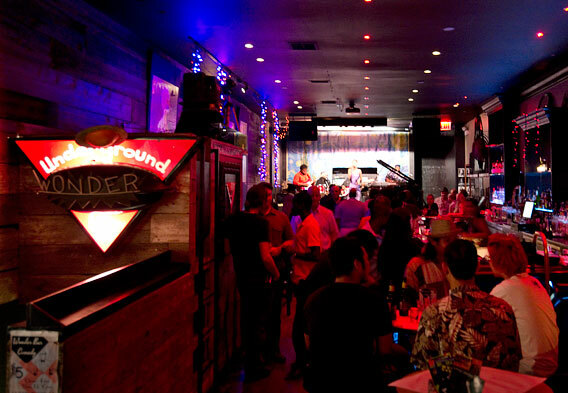 Others are more intimate, as is the case with the Underground Wonder Bar (pictured). This intimate club can be found at 710 N. Clark Street and is without question one of Chicago's most happening and eclectic late night hangouts. Complementing the nightclubs in Chicago are any number of bars, and there are plenty of different venues around town that celebrate the performing arts. Among the best Chicago neighborhoods for live music are Lincoln Park, Lakeview, and Wicker Park. The concentration of clubs is especially high in these areas, and the clubs offer everything from jazz and blues to rock and reggae. For some people, museums are attractions that are best put aside for rainy days. Chicago challenges this viewpoint, offering an array of high quality museums that can more than justify heading indoors on a sunny day. Among the city's main museums are those that can be found in the 10-acre lakefront park that is known as the Museum Campus. These museums include the Adler Planetarium & Astronomy Museum, the Field Museum of Natural History, and the Shedd Aquarium (pictured). It should be noted that some of the best views of the Chicago Skyline can be enjoyed from the Museum Campus. Also, the Museum Campus is linked to the southern section of Grant Park, which is where you will find the renowned Art Institute of Chicago. Other notable Chicago museums include, but aren't limited to, the Chicago History Museum, the Museum of Contemporary Art, the Polish Museum of America, the Museum of Broadcast Communications, and the Museum of Science and Industry. 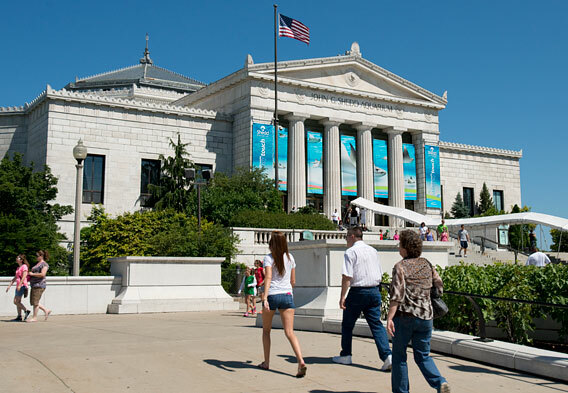 A number of Chicago museums have free admission, and some of the others that charge admission fees can be visited at a discounted price if you purchase a special Chicago attraction pass, such as the CityPASS. Being that it is such a large city that is primed for business and leisure travel, Chicago offers a wide assortment of lodging choices. The majority of the city's best and most luxurious hotels are found in and around the downtown Loop area. These hotels cater to business travelers who want to be close to the downtown offices and the nearby McCormick Place convention center. 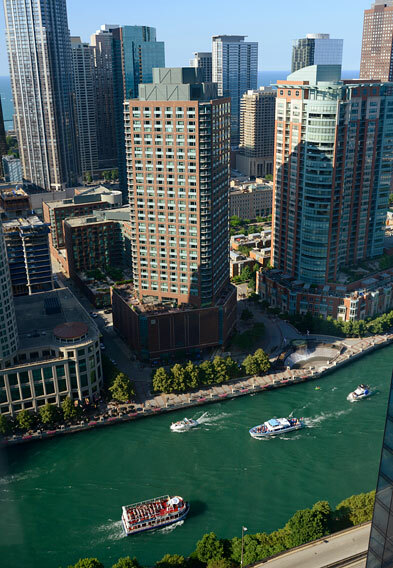 They can also be ideal for leisure travelers who want to be within close proximity of all the fantastic downtown area attractions, including Grant Park, Navy Pier, and the John Hancock Observatory. The downtown lodging scene in Chicago is seemingly always evolving, and a number of newer downtown hotels are doing their best to make the downtown core an especially enticing place to stay. Examples of such downtown hotels include the Trump International Hotel and Tower and the Radisson Blue Aqua Hotel (pictured). While the Chicago hotels figure among the most expensive in the United States, it is often possible to find good lodging deals, even in the downtown area. As such, you don't have to break the bank if you wish to secure a comfortable and convenient Chicago travel base.